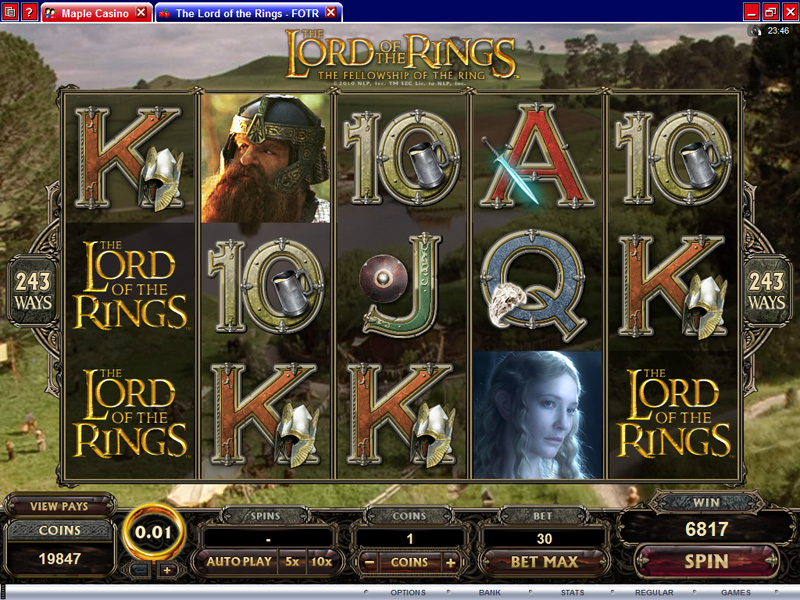 Fellowship of the Ring is the name of the first movie from the LOTR series, so naturally this slot machine was based on it. Microgaming got the rights for this slot machine, but never did finish up the trilogy, so only this first title was created. In case you don’t know what this is about, the game was created based on the first title from a trilogy called The Lord of the Rings. The movie was released in 2001 and it got a lot of awards and attention from the viewers. 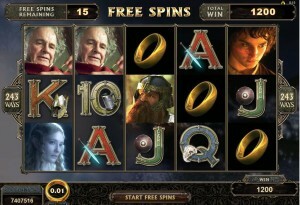 It’s a fantasy themed slot, just like the movie was. 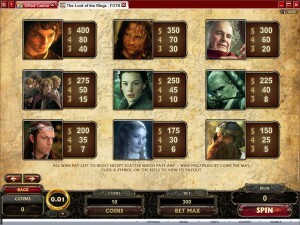 You’re going to get 5 reels and 243 paylines in Fellowship of the Ring. The Gollum feature, the free spins with the random wild reels, the scatters, expanding and stacked wilds, these all are features that LOTR has to give you. It’s not a very rewarding game most of the time though, with top payouts of $600 on the line. 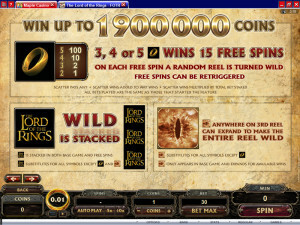 Among the features from the LOTR slot you will encounter stacked wilds, expanding wilds, scatter symbols and free spins with random wild reels. It doesn’t give you a huge collection of features, but the ones you do trigger are going to be much better than what the average slot will give you. 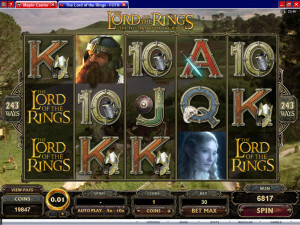 The wins in LOTR are formed through the ways to win system. There are 243 different possibilities of forming a new combo, and they will do that if they’re on consecutive reels, going from left to right. They don’t need to be on fixed paylines, and that’s a big advantage that slots with ways to win have. Let’s look at the stacked wild first, since it’s the one you will see most often on the reels. It has the LOTR Logo on it, with gold letters on a black background. It comes in stacks of three symbols, so whenever it appears it occupies between 1 and 3 spots on a reel. As a wild, it can substitute for regular symbols only, so the expanding wild and the scatter are not included on that list. It is available during the base game and free spins alike. The Eye of Sauron also gets a big role in the game, being the expanding wild. It is reserved for the 3rd reel and whenever it makes an appearance you will find that it expands and covers the reel entirely. You only get this during the base game and it expands only if there are wins to be made when this happens. The Ring symbol, the precious piece of jewelry that everyone is after, acts as the scatter symbol in the game. The simple presence of two to five Rings on the reels will be enough to bring you a prize (1x to 100x the bet) and the free spins (3+ symbols). The game awards 15 spins for free when you have the needed symbols with the Ring in them. 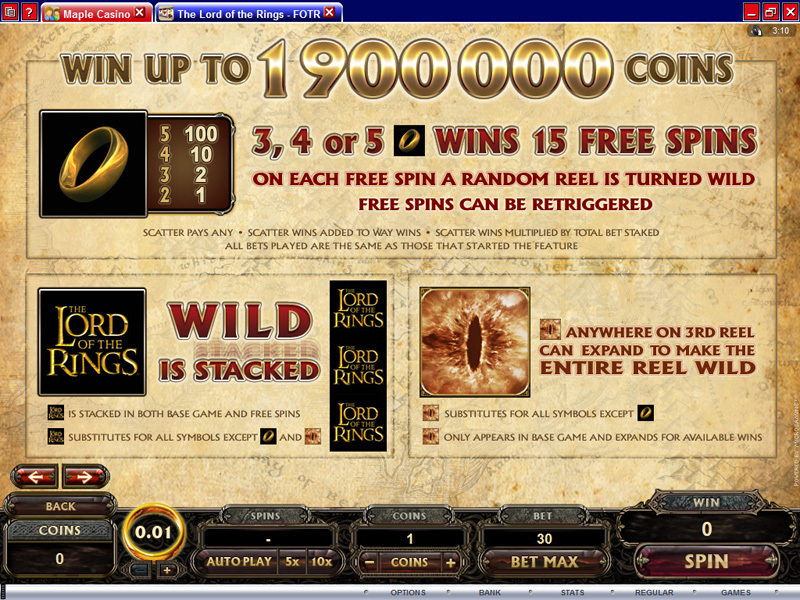 During each free spin, one of the reels will randomly be chosen to turn wild. Retriggering free spins is a possibility as well. 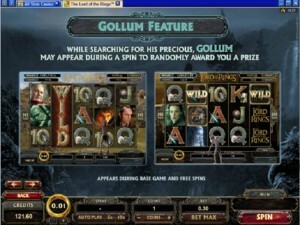 This is a randomly triggered option, which puts Gollum in front of you. He’s looking for his precious ring and he will give you a prize at random when he makes an appearance. Besides the fact that the game has ways to win, so it offers prizes often, it also has rather small wager requirements, so it’s natural for the payouts to be low. Coins have only two possible values, $0.01 and $0.02. You can select 1 to 10 for each line, with 30 lines being used total. That brings you to a maximum bet of $6. The biggest reward comes from the 100x the bet prize coming from the scatter symbol. It will mean $600 cash. The design tries to follow the one from the LOTR movies, so you have plenty of elements from them as symbols. Most of the symbols are photos with the main actors from the movie, the members of the fellowship, but a couple of playing cards are also in it. It’s a good game design wise if you’re a fan of the movies, but it’s not so good that you have to play it even if you’re not a fan of fantasy. Symbols: Ring (100x the bet, scatter), Game Logo (wild), Eye of Sauron (wild), Frodo (400x), Aragorn (350x), Bilbo (300x), The Companions (275x), Arwen (250x), Legolas (225x), Elrond (200x), Galadriel (175x), Gimli (150x), Ace (90x), King (75x), Queen (75x), Jack (60x) and 10 (60x). 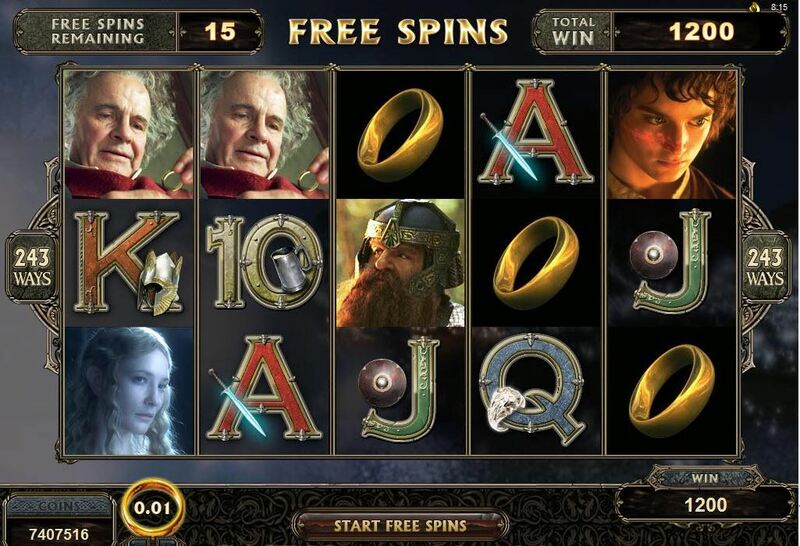 It’s a game that you should absolutely give a try, as long as you’re a fan of Tolkien’s work. You get to play it with all the images of the actors which appeared in it, so it’s going to be an experience you will want to have as a fan. Released in 2001, The Fellowship of the Ring was the first of the Lord of the Rings movies, a trilogy based on the books with the same name from J. R. R. Tolkien. It was followed by the 2002 movie The Two Towers, and then by the third title in 2003, called The Return of the King. The action takes place in Middle Earth, a land inhabited by hobbits, elves, dwarves, humans, trolls, goblins and all sorts of other creatures that belong in a land of fantasy. It got over $871 million at the box office. 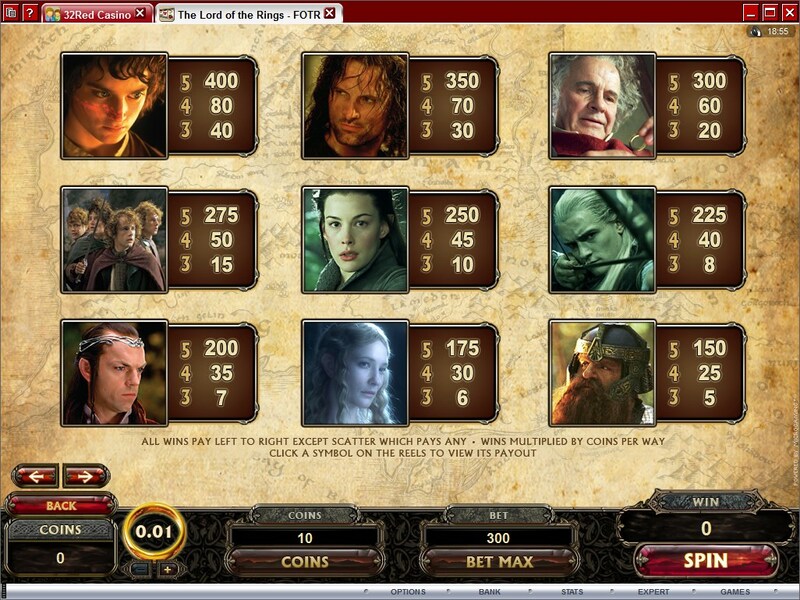 The The Lord of the Rings – Fellowship of the Ring slot machine is offered through the Microgaming platform, so if you want to play it for real or just to practice, look out for casinos that use it.